Of the tens of thousands of Jewish people deported from Nagyvarad, a few thousand survivors made their way back to the city (now Oradea) after they were liberated. As they worked to recover and build their lives anew, they undertook to commemorate the souls of their loved ones, lost in extermination camps. 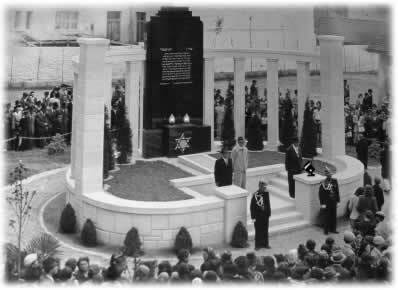 The photo, taken in 1946, shows the monument they erected in the back of the courtyard between the Orthodox Synagogue and what had been the Jewish Boys' School.